Alta guard station to the eyebrow descending skiers right. Ascent of Cardiac ridge and descent. Ascent of Cardiac bowl exit into Mill B, decent of Mineral to the road. It was clear and sunny. South winds gusting into the 20 mph range. Mild temperatures rising quickly after noon. A well frozen surface was found on south facing, of 4-6 inches. Much less deep on off aspects, with a mostly zipper crust on the shady aspects. 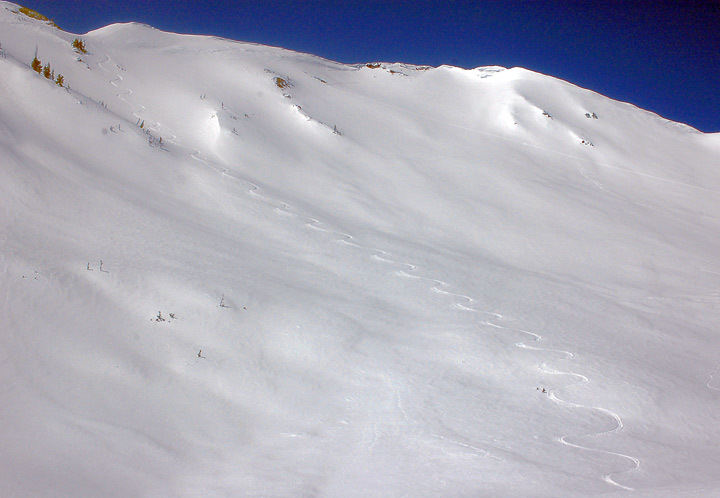 There were localized patches of dry powder above about 10k. North facing off the ridge had a supportable to breakable crust at 9 am. East northeast was sun softened and consistent at 11 am. North facing in Mill B and upper Mineral was patchy dry powder and breakable crust after noon with the east facing remaining consistent to around 8k. Below that elevation, the snow, although damp remained supportable, with rollers of toaster size and some sluffing, depth no more than 4-6”. There has been glide activity. Several cracks were noted in Mill B South and Broads. One release of maybe a hundred feet, full depth. Details of the slide activity can be found here . Clear skies and low humidity combined with the southerly breezes provided a good cooling throughout the morning. Less wind and warmer temperatures in the afternoon quickly heated the snow. I’d imagine with similar forecasted weather, prior to the storm, another refreeze would be expected. A low relative humidity would promote that occurance.